it's not completely irrelevant to Londoners - the citizens of Northwood and Pinner will get direct rail access to the centre of Watford - are they not Londoners? Ken/TfL have agreed to also spend some money on it, which must mean that there's some benefit to Londoners. 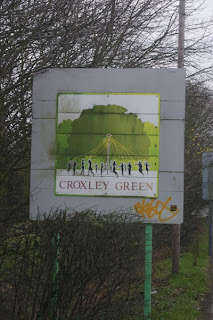 This project has close to my heart since I was a small boy, looking up at the Metropolitan viaduct over the Grand Union canal and the lattice bridge of the Croxley Green branch, and wondering why it was that the two were not joined together. Many times it seemed as if the go-ahead might be given but, with the Balkanisation of the railways and the eventual stealth closure of the CG branch, it looked as if the moment(um) was lost forever. All is not lost though! Thanks to the dogged persistence of Hertfordshire County Council and the relevant districts, the DfT will now have to justify themselves if the scheme *doesn't* proceed. "But it is the only extension of the tube network on the table right now." Would be great to have, for example, a Chesham - Watford J service, could cut out a lot of the traffic between Ricky and Watford. While I have nothing whatsoever to do with the Watford area, in my view this scheme is a no-brainer. In fact, when looking at the map of the current situation, it's hard to imagine why anyone might be negetive about the idea. The cost is pretty low in comparison to the benefits of regenerating the area around the disused trackbed, and improving interchange options at Watford Junction. Many a Londoner with occasion to travel to Watford has been lured to Watford Underground (surely not 'tube') station only to find themselves in the middle of a housing estate, few buses and a 15 minute walk to Watford. ERM, ARE WE NOT FORGETTING THE WRITING IN THE SMALLPRINT THAT THE PROJECT COULD INVOLVE CLOSURE OF WATFORD MET? THAT WOULD MEAN HUNDREDS IF NOT 1000S OF COMMUTERS SERVED BY WATFORD MET STATION IN ITS PRESENT LOCATION IN THE CASSIOBURY ESTATE- NOT TO MENTION THE SPRAWLING ACSSIO DEVELOPMENT- ALL STAND TO BE DEPRIVED ON A PUBLIC TRASNPORT HUB ON THEIR DOORSTEP -RIPPED UP IF THE CROXLEY LINK GOES AHEAD JUST SO SHOPPERS FROM PINNER CAN GET TO WATFORD. West Watford Station is (will be) only 800m away from Watford Met and the majority of users of the Met station (anyone south of Rickmansworth Road) would be better served by West Watford anyway. Those on the East side of Cassiobury Park haven't got that much to choose between the walk to the Met and the Junction, so it really is only to the detriment of those living on the West side of the park and that's not exactly built up. So it is a no-brainer. Those living West of the Park will have a short walk to Ascot Road. It really doesn't inconvenience anyone and the benefits are vast. In any event everyone buying in those newly developed estates should have known this plan was on the table. Surely services could alterate between te current route and that to west and Junction?